Elizabeth Arden Green Tea Honeysuckle is gentle, calm feminine fragrance. 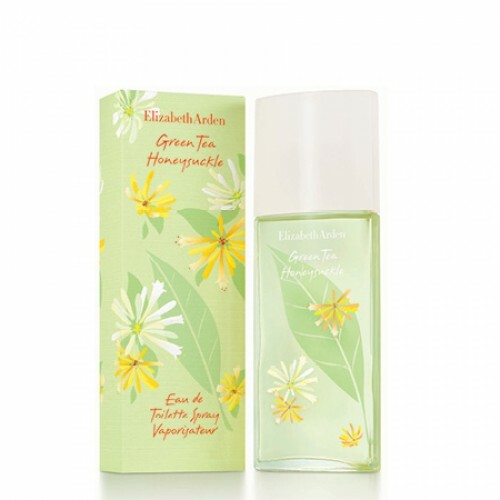 Elizabeth Arden Green Tea Honeysuckle 100ml. Eau De Toilette - Elizabeth Arden this spring launches its new fragrance Green Tea Honeysuckle . This updated version of the perfume Elizabeth Arden Green Tea. Perfume will give freshness and excitement in anticipation of spring hot summer. Perfect blend of honeysuckle and fresh green tea leaves. Green Tea Honeysuckle - this is the best fragrance for the modern, active woman, but at the same time gentle, elegant and romantic. Rodrigo Flores-Roux perfumer created this spring fragrance. Top notes of lemon, green tea, bergamot, mandarin, boysenberry. Middle notes of honeysuckle, jasmine, ylang-ylang, green tea, neroli Tunisia. Lower notes: peach, musk, birch, amber. A continuation of the collection of Green Tea. Its author is a perfumer Rodrigo Flores-Roux. Composed of green floral bouquets this refreshing fragrance is the personification of happy childhood memories and youthful optimism. He acts as memories of charm flower fragrance and sweet nectar. This Perfume created for young, flirtatious, graceful, charming, playful and air heads. Elizabeth Arden Green Tea Honeysuckle is the influx of summer freshness. Floral fragrance awakening in girls flirtatiousness, youthful look and a smile on his face. Charming fragrant aroma boasting a distinctive freshness. Irresistible and gentle intoxication cream flavors. Elizabeth Arden Green Tea Honeysuckle brings green and utterly irresistible composition of many elements. Since bergamot, over green tea to a mandarin, blackberry or birch. Rich conjunction aromatic essences, in which you evoke pleasant memories in the summer spirit. Floral composition, as if summoning feelings of spring and summer. Green vial of Elizabeth Arden Green Tea Honeysuckle is the epitome of natural and fresh tones. Wrap refreshing citrus collection that is full of lightness, tenderness and sensuality. Awaken the youthful energy that will accompany you at every step.